Some scholars are convinced an ancient, advanced civilization existed where the nation of India is today. They claim the prehistoric city-state had advanced technology including high-energy weapons, jet-like aircraft, and even the atomic bomb. Now a stunning artifact has been identified by some researchers as the part of an aircraft landing assembly dated as old as 20,000 years made from a metal that wasn’t discovered until the early 1800s. For many years certain researchers in India and Asia have tried to convince Western skeptics that the so-called religious texts of the Vedas are really descriptive history. Lending credence to their claims are various artifacts found over the years and detailed descriptions of the vimana aircraft engineering and construction. The incredible discovery during the 1990s of the remains of an ancient city in northern India that was still highly radioactive sent some archaeologists scrambling to the site. And then, a very strange artifact, the Wedge of Aiud,first unearthed in 1973, was given another look: a machined piece of metal made of an aluminum alloy. Originally thought to be about 400 years old, new tests have determined it’s from 18,000 B.C.E., from the during the Pleistocene Era, nearly 20,000 years before aluminum’s discovery in modern times. Odder still, some experts believe the artifact may be part of an aircraft landing gear…possibly from one of the ancient Indian vimana flying machines described in the Veda texts. Evidence that has accumulated during the past few centuries adds credence to the idea that super city-states arose sometime towards the end of the last Ice Age. The best evidence for the location of some of the cities—that may have spanned the globe—lies in northern India and southern Pakistan, and a desolate stretch of the Mongolian Gobi desert northwest of China. Those advanced cultures are said to have possessed a very high technology, equal in some respects to that of the 21st Century. Ancient texts refer to towering buildings, various types of aircraft, a high level of science and engineering, and even a weapon that today’s physicists believe was first used in the closing days of World War Two: the atomic bomb. It may be that the advanced cultures wiped themselves out by engaging in a limited nuclear war. Evidence gleaned over the past few decades does point in that direction. Perhaps after a series of devastating attacks, the remaining network of advanced cultures collapsed succumbing to the ravages of economic depression, displacement, and disease. If so, the vestiges of one or more of those cultures may have served to fuel the legend of the great city of Atlantis that appears in Plato’s 360 B.C.E. Dialogues, Timaeus and Critias. After the collapse, the remainder of Mankind fell into barbarism and knowledge of the fantastic technology devolved into myth. This viewpoint is supported by the fact that some of the earliest cave paintings reveal a greater level of sophistication than those that were created hundreds of years later. The human race regressed and the once great glories of the super-cities occulted by the swirling mists of time. According to the revered Indian Vedas Sanskrit writings, vimanas were flying machines. The word vimana is still used today in the modern Indian language to refer to aircraft. 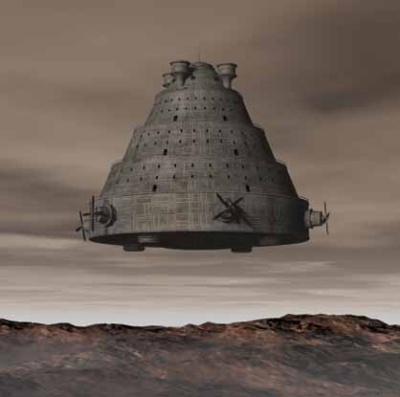 While most vimanas were used for transportation through the atmosphere, some were described as being used to travel into space while others were a form of limited submarine. Just like modern aircraft, the vimanas had various configurations and sizes depending on what they were designed to accomplish. Some had two engines, like the agnihotra-vimana; others, like the gaja-vimana, had more. In all there may have been as many as a dozen different types of vimanas all designed for different purposes. Most of them flew. Traces of an ancient atomic war between advanced and powerful city-states still linger in northern India-Pakistan and parts of the great Mongolian Gobi Desert. Scientists have known for many years about the expanse of vitrified sand that covers a region of the Gobi. The fused sand, greenish in color, can only be created by exposure to intense heat. Geologists theorize that the sand became vitrified by exposure to volcanic action; astronomers claim a large meteor might have done it; physicists wonder if it was caused by an atomic explosion. Those three incidents are the only things that could account for the region of vitrified sand that lies in the lonely stretches of the arid land. But volcanic origins are out as no volcanoes exist in the region. No evidence exists of a crater or meteoric residue that would be found if a rock from space slammed into the desert scarring the terrain and searing the sand. The process of elimination leaves only an atomic blast to account for the strange condition of the sand—a glassified region where nothing grows. Supporting the atomic theory is the fact that some of the area has a higher level of background radiation than similar terrain outside the affected area. It’s almost as if something once stood in that deserted region and was vaporized by a blast like the explosions that destroyed Hiroshima and Nagasaki. Another find that supports the existence of a technologicaly advanced city-state about 20,000 years ago was the stunning discovery of the remains of an ancient city in the northwestern state of Rajasthan, India. The site was found when construction began for a new housing development. What astonished archaeologists eventually determined was the remains of charred and partially melted buildings and radioactive skeletons were covered by a thick layer of ash—later confirmed to be radioactive. The ash covered a three-mile square area. Other research shows that several major city states existed and at least two or more were at war with each other. While much attention has been focused on the northern Indian city, little has been spent investigating the remains of the ancient atomic blast in the Gobi. The ancient region is thought by some Indian university professors to be a forerunner of the more modern Matsya, another ancient state of the Vedic civilization. The Matsyan culture is believed to be associated with an earlier state called Jaipur. “A single projectile charged with all the power in the Universe…An incandescent column of smoke and flame as bright as 10,000 suns, rose in all its splendor…It was an unknown weapon, an iron thunderbolt, a gigantic messenger of death which reduced to ashes an entire race. “The corpses were so burned as to be unrecognizable. Their hair and nails fell out, pottery broke without any apparent cause, and the birds turned white. The atomic conflagration described was every bit as horrific and deadly as the attack on the Japanese cities in August, 1945. Although the text suggest delivery of a nuclear weapon by a missile, ancient Indian writings also describe—in amazing detail—the flying machines called vimanas. The texts outline the vimana’s flight characteristics, construction, powerplant ( a jet-rocket hybrid powered by plasma mercury engines), and engineering specifications. Near the picturesque banks of the Mures River located a little more than a mile east of the small city of Aiud, Romania, a bizarre artifact was unearthed dubbed the Wedge of Aiud. The test results puzzled the two researchers as aluminum wasn’t discovered until the early 1800s. Fischinger notes that commercial production of aluminum requires smelting the ore at temperatures up to 1,000 degrees Fahrenheit. Initially, the object was though to be about 400 years old. That changed dramatically when they carefully analyzed the amount of oxidation covering the wedge. They readjusted the age backwards by thousands of years. It’s now estimated the Wedge of Aiud may date back to 18,000 B.C.E. That date coincides with the age of thevimanas. After the test results were analyzed, the wedge was sent to the Museum of History in Transylvania, Romania where it sat on a shelf, undisturbed, for two decades. Finally, in 1995, another Romanian researcher, Florian Gheorghita, came across the artifact in the museum basement. The wedge was tested again. This time in two different laboratories: the Archeological Institute of Cluj-Napoca and an independent Swiss lab. The tests confirmed the results arrived at by Fischinger and Niederkorn. Gheorghita wrote in the publication Ancient Skies that he asked an aircraft engineer to study the artifact. The engineer noted the configuration and the hole drilled in the wedge and stated that a pattern of abrasions and scratches on the metal led him to believe it was part of an aircraft landing gear. Since the ancient city-states had advanced transportation—perhaps even space vehicles—it was easy to transnaviagte the world just as modern aircraft do today. The engineering and metallurgical evidence strongly supports the theory that the mysterious Wedge of Aiudis a pice of a landing gear that fell off a vimana some 11,000 years ago and lay unretrieved for millennia until the sandy banks of the Mures River swallowed it up. This entry was posted on May 20, 2012 at 9:49 pm and is filed under Ancient Aryan Civilizations and Archeology, UFO Sightings and Vril Technology News. You can follow any responses to this entry through the RSS 2.0 feed. You can leave a response, or trackback from your own site.